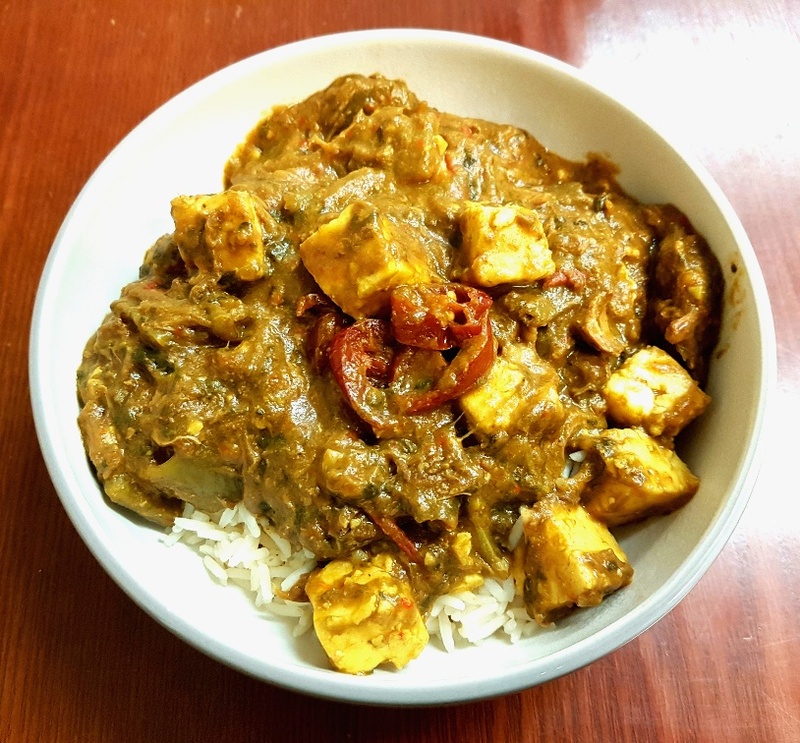 As much as I adore Indian food, the first time I heard about Saag Paneer, a spinach and cheese curry, I was extremely sceptical. I thought, who on earth would want to put cheese in a curry? However, as I say, I’m a huge fan of Indian food, so I was prepared to put my faith in a cuisine I love and give it a go. I’m so pleased I did because saag paneer is absolutely delicious! I realise that it might not look like a particularly alluring curry, but trust me, this curry is outstanding! In case you don’t know, paneer is an Indian medium-firm cheese which is normally cut into cubes and then added to curries. It’s not a strong cheese – I’d probably compare it to a firm mozzarella-type of flavour – so it can be used in loads of dishes. In fact, it can even be marinated and then grilled in much the same way as halloumi can. Also, for those who can’t tolerate dairy or are allergic to it, I’ve made this a number of times using non-dairy cheeses, such as Violife’s mozzarella cut into cubes, and the non-dairy version works just as well. This recipe for saag paneer celebrates the tender vegetable which is the spinach leaf as well as the tasty cheese which is paneer, producing a well-seasoned and very flavoursome curry which goes well with rice or scooped up and eaten with gluten-free naan breads. You could even serve it as a side dish to go alongside curries, such as Chicken Korma or Lamb Dansac. Boil the new potatoes until they are soft and then drain them and keep them to one side. Heat a large saucepan over a medium heat and add the oil. Once hot, add the fresh minced ginger, spices and red peppers. Cook for a few minutes before adding the chopped tomatoes, potatoes and spinach. Cook until the spinach has wilted down and then add the paneer. Cook for 10 minutes or so until the curry has thickened. Season to taste before stirring the natural yoghurt through the curry and serving.